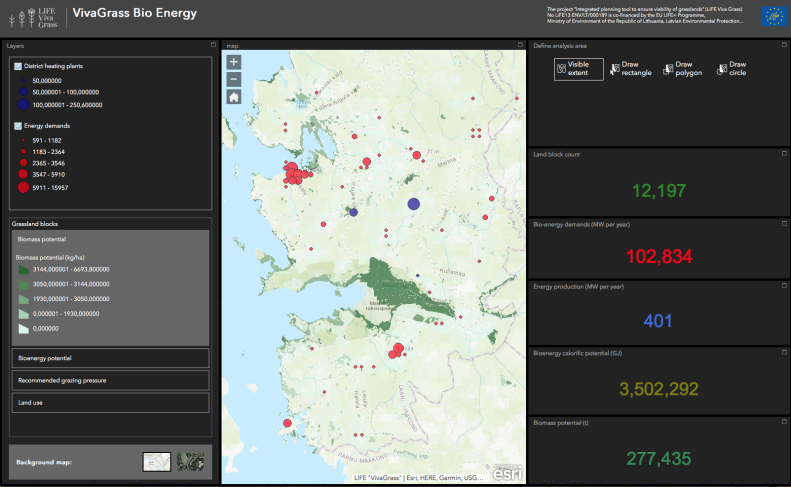 Integrated planning tool developed within the project aims on helping to make decisions for sustainable grassland management by strengthening linkages between social, economic, environmental, agricultural fields and policies. 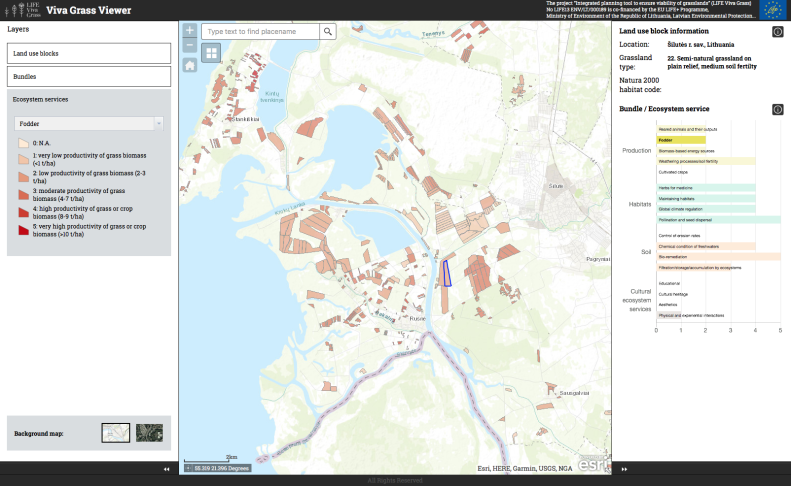 The tool works on GIS (geographic information system) based environment and incorporates ecosystem services as well as socio-economic parameters. 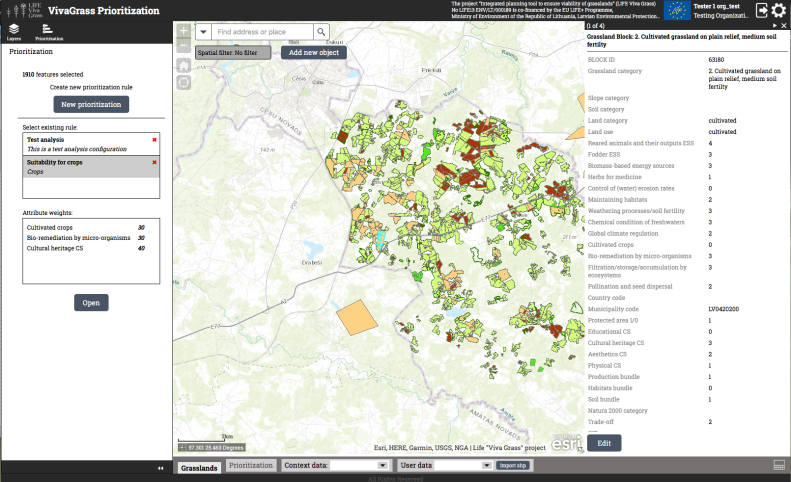 The Integrated Planning Tool gives an opportunity to see the benefit grasslands provide for people from different perspectives. The Tool has three application – two of them are open for public use, while one of them requires registration. Applications automatically calculates ecosystem services of grasslands in demo areas according to various criteria set by scientists. In three Baltic states there are 9 demo areas. Currently, you can test demo versions of all applications, which will be improved during this year according to the comments of different stakeholders. You are invited to express your comments to: justas.gulbinas@bef.lt. 1. „Vivagrass Viewer“ is an application dedicated to increase public’s awareness about ecosystem services of grasslands and it’s assessment e.g. the public user can check what ecosystems services are provided by specific grassland or type of grassland, it can also compare different grasslands between themselves and other. The application access is open. 2. „Vivagrass Bio Energy“ is an application dedicated to evaluate the possibility of grassland biomass use for heating e.g. public user can get to know which grassland or group of grasslands have the biggest potential to use it’s biomass for heating. The application access is open. 3. „Vivagrass Planner“ is a restricted-use application for specialists that enables professional users to insert additional data and make more comprehensive analysis of grasslands e.g. the specialist can set the value for every ecosystem service and make the map that shows grasslands prioritised according to the criteria set. This map can later be used for spacial planning e.g. the results gained could be used in several ways: 1) this information would let protected area managers decide how to distribute their financial and human resources in managing the most important grasslands; 2) municipality specialists could use this information when deciding which Giant Hogweed plots should be managed first. If you want to test this application, please, contact project team via e-mail justas.gulbinas@bef.lt to get the registration code. „Vivagrass Viewer“ and „Vivagrass Planner“ can count the trade-offs of ecosystem services i.e. how much one ecosystem service is changing after other ecosystem service is increased / decreased, according to land use. Project team will organise special seminars about use of the Integrated Planning Tool and it’s applications. All functionality and functions of the Tool will be presented there. If you have any questions or comments about the Integrated Planning Tool, do not hesitate to contact project team via e-mail: justas.gulbinas@bef.lt.